Google's more recent focus on local results for product and service-related searches made a big impact on how many businesses are found. Some businesses noticed less shift because of the way their online presence had been set up, but for others it was a game changer. Doing a search for "pizza places" in your local city now produces a list that stems from Google's maps before it shows regular organic listings. That means that even if a given pizza restaurant had the #1 organic spot, they may no longer be the first business a person sees. 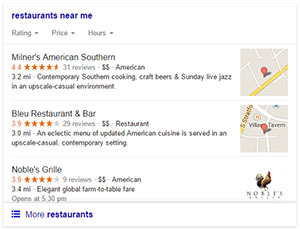 With the addition of local listings came an opportunity many businesses were not leveraging: Google reviews. Having positive Google reviews was always a nice bonus for your business, but there were so many other ways for prospects to reach your site that it was easy for a lot of people to prioritize other aspects of SEO first. With the major emphasis on local results, though, Google has made it easier than ever to compare similiar businesses on the fly. That search for pizza places will now show a handful of nearby pizza restaurants, each with their star rating and the nunber of reviews. In seconds a viewer can draw conclusions about each result and make a decision about which one(s) to call. Google reviews can be a tie-breaker. If a person has narrowed their search down to two places and can't decide which, the one with the higher rating or more reviews may win out and make the person feel more comfortable with that choice. Both businesses might have a 4.5/5 rating, but if one of them has 5 Google reviews and the other one has 30, which would you choose? They exceed their customers' expectations to such a degree to inspire that many people to take time from their day and talk about it. Marketing studies have shown that people are more likely to share negative experiences than positive ones. Think about it. If you went to a restaurant and had a truly awful experience, you'd be more likely to make it a point to tell people about it online than if you visited and had a nice evening. Good service is often considered a given, so providing good service isn't always enough to spur them into leaving a review. And let's face it: negative reviews happen. But what's the best way to handle that? Review systems and reputation management can track reviews of all kinds across various online mediums, so no matter where someone is talking about your business you'll be able to follow it. This allows you the opportunity to fix it when someone is unhappy. That may turn that person's opinion around by a prompt response you may not otherwise have been able to give, and that means you've saved a customer. Plus, when that dialogue happens in a public forum like Google or Facebook, other people can see that it was resolved well. Customers respect companies that own mistakes and go out of their way to make things right, so it can be an opportunity to turn a negative into a positive. When it comes to stimulating more positive Google reviews, the easier you make it for customers the more likely it is to happen. As mentioned above, good service doesn't always empassion someone enough to go out of their way to leave a review. But if they are prompted at the right times and leaving a review is made simple enough, many of these same customers would happily do so. The more likely customers are to leave Google reviews (or on other platforms) the better your search rankings and ability to compete. Contact us today for more information about reputation management systems to increase your bottom line!